This lamp is not only a lighting tool for your house, but also a nice decoration to your home, waterproof design, suitable for outdoor use. Energy saving, long service life. 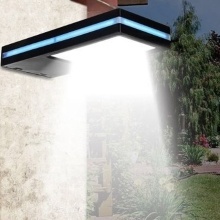 Eliminating darkness by using the light emitting diodes. Contributing to a safer environment. Suitable for the courtyard, municipal construction, park, villa, residential area, indoor. Auto turn on when in darking or at night, and auto turn off when in daytime or bright area. Bright light mode: when people walk around 8-12 meters close, it will turn on bright light.